Poll: Which topic should you discuss in your client email’s first paragraph? So when you email a request for action to a client, what should you discuss in the first paragraph? Please answer the poll in the right-hand column of my InvestmentWriting blog. I’ll report the results–and share my bias with you–in next month’s newsletter. The NAPFA MA members who attended my email writing workshop know my leanings, but I wonder if I’ve convinced them to change their habits. I’ll report on the poll results in my February e-newsletter. 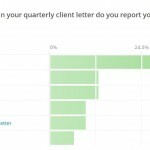 Quarterly client letter poll: Where do you put performance? https://www.investmentwriting.com/newsite/wp-content/uploads/2016/12/investmentwriting_logo_2016.png 0 0 website admin https://www.investmentwriting.com/newsite/wp-content/uploads/2016/12/investmentwriting_logo_2016.png website admin2010-01-06 16:28:002013-09-22 14:56:42Poll: Which topic should you discuss in your client email's first paragraph? I LOVE this fixed income presentation! Do you go crazy over misspellings?